In the wake of the American election in November 2016, five months after the EU referendum in Britain and with the far-right rising in almost every country of the European Continent, we have a glut of interpretations of current political and social conditions in the Western world. 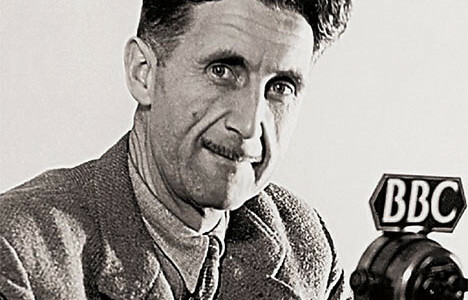 Although these interpretations are diverse, there seems to be near consensus about one particular thing: George Orwell is now more relevant than ever. Orwell’s famous depiction of a totalitarian dystopia in Nineteen Eighty-Four has often been a source of comparison with our contemporary situation. Governments, as a more subtle version of an omnipresent ‘Big Brother’, have put surveillance cameras in most public spaces and we, as citizens of democratic states, worry that we have voluntarily given away our right to privacy in the name of security. Some would say that the fate of Winston Smith in Nineteen Eighty-Four prefigures how, in recent years, leakers and whistle-blowers such as Edward Snowden, Julian Assange and Chelsea Manning have been persecuted or imprisoned for challenging this system and telling the world that we’re being watched without our authorization. ‘Newspeak’ has arguably become the standard political language of the early 21st century; deployed, for instance, when European leaders turn a blind eye to major human rights violations, and regard Turkey as “a safe third country” (as was explicitly stated in the EU-Turkey deal signed in March 2016) or when the French Presidential candidate François Fillon said during his campaign that French colonialism was merely an act of “sharing our culture”. However, Orwell is now relevant not only for his representation of a dystopian totalitarian society but also for his largely neglected wartime essays on Nazism and antisemitism. One way to think about this work is in relation to ‘hidden persuasion’ and how this operates not only from outside (via propaganda) but also from within the psyche itself. The accounts Orwell offers may resonate especially for those who are interested in the relationship between psychoanalysis and history. Indeed, Orwell’s musings here have many affinities with contemporaneous clinical work on racism and the so-called inner world. Unlike many other British writers of his time who preferred to construct myths about the “good British” and the “bad Germans”, Orwell approached Nazism through the method of introspection; by shifting focus away from studying Nazi Germany as some kind of ‘other’, he proposed bringing aspects of Nazi psychology back home, to his consideration of Britain and indeed the self, beginning with himself. To consider this, we need to begin first with the observation that Orwell insisted upon taking seriously the emotional field of politics, and our tenuous relationship to reason and truth. Lately this relationship has come to be known as ‘post-truth’ politics, that is, according to the OED, “the circumstances in which objective facts are less influential in shaping public opinion than appeals to emotion and personal belief.” The term ‘post-truth’ was already prefigured by the ‘affective turn’ (i.e. a way of understanding emotional experience – including bodily experience – outside of the paradigm of representation) in the academic study of politics and voting behaviour, particularly after 9/11. However, while the role of emotions in politics is not brand new in academia, the gradual dominance of ‘post-truth’ in contemporary politics presents an alarming development. We should, take this phenomenon into serious consideration now, just as as Orwell did more than 70 years ago. In a 1940 review of the English edition of Mein Kampf, Orwell underlined Hitler’s emotional appeal – drawing attention to a master of ‘post-truth’ politics before the term was even invented. “I should like to put it on record”, he wrote, “that I have never been able to dislike Hitler…I have reflected that I would certainly kill him if I could get within reach of him, but that I could feel no personal animosity. The fact is that there is something deeply appealing about him.” Rather than just branding the attraction to fascism abhorrent, Orwell explored what made Hitler compelling. On the one hand, Hitler was a figure of the “pathetic, dog-like face, the face of a man suffering under intolerable wrongs,” of “the martyr, the victim, Prometheus chained to the rock, the self-sacrificing hero who fights single-handed against impossible odds.” In Orwell’s view, Hitler seemed able to kill a mouse and know how to make it seem like a dragon. On the other hand, Orwell highlighted the fact that Nazism is psychologically “far sounder than any hedonistic conception of life.” Hitler was thus loved and pitied as a victim, but also feared and awe-inspiring as a leader. In this attempt, Orwell did not attribute the appeal of Hitler to some particularity of the German people, but to emotions both universal and ordinary: sympathy for the weak and yearning for struggle. Such an observation, which invites us to consider how personal emotions influence the political realm, rather than rejecting out of hand their legitimacy, could also be key to understanding the appeal of far-right politicians today, such as Donald Trump in the US, Nigel Farage in the UK, Norbert Hofer in Austria, or Marine Le Pen in France. 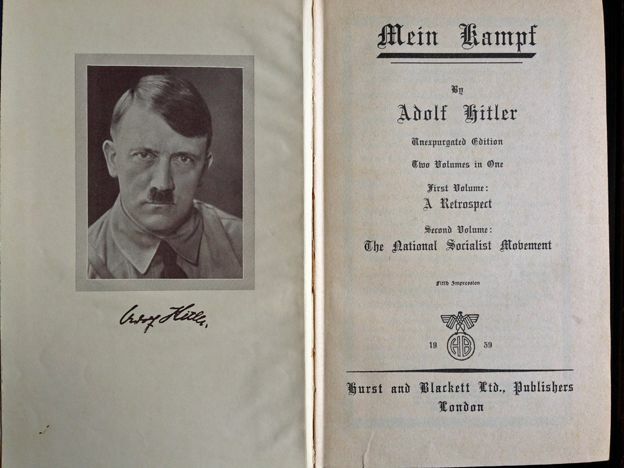 The frontispiece from the edition of Mein Kampf that George Orwell reviewed in 1940. One year later, in 1941, Orwell wrote two essays in which he offered a critique of the work of some of his compatriots who had argued that fascism was completely alien to British culture. In ‘Wells, Hitler and the World State’, Orwell argued that the Nazis were “the truly modern men,” and modern Germany was “far more scientific than England, and far more barbarous.” Here Orwell was challenging the English writer H. G. Wells’ view, that Nazi ideology, being anti-liberal at its very core, would stand on the side of reactionary Romanticism and would reject any technological achievement. Orwell suggested instead that in order to fully understand Nazism, people should not merely believe that modern reason, as a value of the Enlightenment, would triumph over the absurdity and irrationality of Fascism. He rejected, in other words, a teleology of inevitable progress. Instead, he advocated turning again to the self and looking for the “Fascist streak” within. Orwell was not a supporter of psychoanalysis, but this might be compared with Freudian thought, even specifically with Freud’s account of the death drive, an unconscious propulsion towards destruction and self-destruction. Extending this less well known aspect of Orwellian thought to the current political situation, we might recognize how many well-meaning liberal commentators are convinced that “reason will prevail” and that people voting for far-right populist parties or policies will continue to be marginalised. Yet we now know how this complacent set of beliefs failed to reflect on how swelling anxiety – triggered by a collapsing welfare state, an exclusionary education system, rising poverty, and other factors – was easily transformed into support for a politics that expresses hatred for others, be they Jews, African Americans, Mexicans, or Muslims. In ‘The Lion and the Unicorn: Socialism and the English Genius’, Orwell analysed two characteristics of British society that he recognized were also components of Nazism: imperialism and patriotism. Turning again to England rather than Germany, he argued that those who simply celebrated this country’s gentleness or assumed some indigenous antipathy to war amongst people on these shores, disregarded, or hypocritically downplayed, the elephant in the room: imperialism. “After all,” he wondered, “the English have absorbed a quarter of the earth and held on to it by means of a huge navy. How dare they then turn round and say that the war is wicked?” With regard to patriotism, he added that “(o)ne cannot see the modern world as it is unless one recognises the overwhelming strength of patriotism, [and] national loyalty,” and that even in England, “the most class-ridden country under the sun,” patriotism is stronger than class-hatred. Now, if we attempt to analyse the cultural meanings embedded in the Leave campaign at the recent British referendum, such as Boris Johnson’s statement that “Napoleon, Hitler, various people tried this out, and it ends tragically. The EU is an attempt to do this by different methods . . . there is no underlying loyalty to the idea of Europe”, we could argue that, in likening the EU to historical figures who have historically been seen as the British nation’s arch-enemies , the backers of the Brexit campaign drew on emotions of patriotism and national pride. Whatever else was at stake in the campaign, or in people’s diverse motives for voting one way or the other, one dimension was a longing for lost hegemony, including an imperial nostalgia. At the very least Orwell invites us to consider the power of unspoken emotions and of hypocrisy in the debate around British national identity and the EU. Finally, in a 1944 Tribune column and the 1945 essay “Anti-Semitism in Britain,” Orwell discussed antisemitism by shifting his interest from Germany to his own country, where he believed antisemitism was also ubiquitous. In the 1944 piece he observed that after writing some book reviews “defending the Jews,” he received numerous antisemitic letters from “reasonable” British people. Thus, Orwell stressed that antisemitism was not a characteristic of some mad, hateful, brutal people, but of humans who resorted to experience to establish their argument. Antisemitism, he argued in this article, had been a widespread phenomenon in English culture as early as Chaucer and Shakespeare. He went on to suggest that the Nazi mass persecution of the Jews had divided British anti-Semites. For some their racial hatred only intensified; others pulled back, suggesting this was not a time to “throw stones at the Jews.” Orwell claimed that in the former group were, especially intellectuals and other self-defined left-wing thinkers, like himself. “Thanks to Hitler,” they were now ashamed of their own antisemitic feelings and often now prone to insist they must not be infected by this irrational – foreign – form of antisemitism. However, Orwell aptly pointed out that by taking this position, the intellectuals who wanted to learn more about antisemitism failed to start the investigation by looking within themselves. In recent years, few leftist and liberal thinkers have openly considered whether their own racism, misogyny, classism, or other forms of fearing the Other were implicit in their own thinking and actions, with the unintended consequence of contributing to the very problems that they wished to solve. However, now that the recent elections and referenda have made clear the popular discontent with the status quo, it is almost a historical necessity for intellectuals to start taking into consideration their own prejudices and biases . Of course there are many ways to perform this kind of self-analysis. But Orwell certainly offers a powerful model for thinking about how what one hates in others might be present, in some form, in oneself. There is no doubt that in our ‘post-truth’ era, Orwell’s writings could prove useful in our effort to find meaning in a political and social framework that often seems meaningless. While Nineteen Eighty-Four offers a compelling vision of a world order we would wish to avoid, Orwell’s essays show how he himself attempted a kind of self-diagnosis, which he also then described in his writing. He shows us, in these texts, how he endeavoured to overcome the habits of thought within himself that contributed to the everyday workings of fascism, antisemitism, and other forms of post-truth. Essential to that quest was his recognition – from within himself – of the profound role of emotion in politics. To insist on this presence, and to seek to grasp their qualities was, for him, a crucial first step in fighting against fascism and racism. Before judging or condemning others, Orwell reminds us, again in a manner curiously reminiscent of Freud’s, that we could start by following his advice and looking for sources of fear and irrational hatred “in the one place where [we] could get hold of some reliable evidence,” that is, our own mind. For a more detailed account of Orwell’s study of Nazism. see Danae Karydaki, “National Socialism and the English Genius: Revisiting George Orwell’s Political Views on Nazi Ideology.” Dapim: Studies on the Holocaust 30, no. 1 (2016): 53-73. For a full picture of Orwell’s wartime writings, see Sonia Orwell and Ian Angus, (eds. ), The Collected Essays, Journalism and Letters of George Orwell, Vol.II: My Country Right or Left (London: Secker & Warburg, 1968). George Orwell, ‘Review: Mein Kampf by Adolf Hitler’ (unabridged Translation),(1940), in Sonia Orwell and Ian Angus, (eds. ), The Collected Essays, Journalism and Letters of George Orwell, Vol.II: My Country Right or Left (London: Secker & Warburg, 1968), pp.13-14. George Orwell, ‘Wells, Hitler and the World State’ (1941), in Orwell and Angus, (eds. ), The Collected Essays, Journalism and Letters of George Orwell, Vol.II: My Country Right or Left (London: Secker & Warburg, 1968), pp.139-145. George Orwell, ‘The Lion and the Unicorn: Socialism and the English Genius’, (1941), in Orwell and Angus, (eds. ), The Collected Essays, Journalism and Letters of George Orwell, Vol.II: My Country Right or Left (London: Secker & Warburg, 1968), pp. 56–109. George Orwell, ‘As I Please’, Tribune, February 11, 1944. George Orwell, ‘Anti-Semitism in Britain’, Contemporary Jewish Record, 8:2 (1945). Danae Karydaki is a modern historian, holding a PhD from Birkbeck, University of London. Her current research interests and publications include accounts of the British wartime and post-war responses to Nazism, the history and historiography of mass violence, race and gender discrimination, nationalism, and the use of psychoanalysis for the study of history. She has taught undergraduate and postgraduate students in the departments of History, Politics and Psychosocial Studies at Birkbeck, University of London and works as a freelance journalist and columnist for the Greek media.